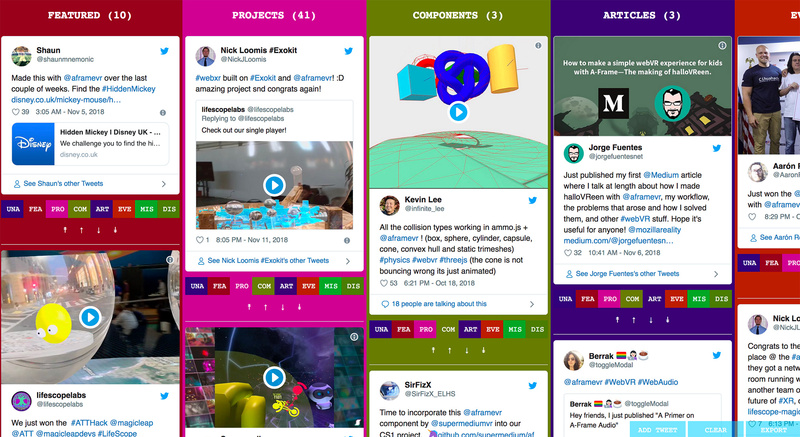 What's up with A-Frame, a WebVR framework for building virtual reality experiences, from Oct 12, 2018 to Nov 23, 2018. Part 2 of 2 of catching up. Sorry for the delays! I’ve built A-Frame Weekender, a tool for myself to get these out faster without spending hours per week. Work has started on getting WebXR support into A-Frame, though progress on the spec is yet ongoing, browser support is limited, and feature parity with WebVR 1.1 is still not there. But something to have to do going forward. 0.9.0 should release before end of year! "QUAK" is a quake + duck hunt mashup made with @aframevr. A #webvr game made with @aframevr and #b3d, it's #opensource on GitHub! Fun to play with lighting for #carrot #codevember 03, and great motivation to continue building on the same @aframevr #webxr project from day to day. @Eberly_ODL Chemical Reaction Lab in process…. Examples for sending data from @BITalinoWorld into #wekinator, @aframevr and #supercollider via #processing are up at https://t.co/KrBgFdQPgZ. sonify, vr-ify, ml-ify your biosignals. Fun times learning responsive controls in @aframevr: on my Go I have two controllers, one floating above the other. On Vive+Firefox I have 1 controller in hand, & 2 hands pinned to the floor. I've been working on a simple flow editor for fun during my commute and thought this morning to see if I could create @aframevr components with it. See video for an example. Is there any open-source project like this out there? Thank you, @ktrogolo for bringing @aframevr to the @TheParkSchoolMA’s @GirlsWhoCode club last year! So happy to share our work at @masscue’s #masscue18 conference yesterday! You’re an awesome collaborator and role model for our girls! Had a good evening with giving a WebVR/@aframevr workshop at @YachtNL. Some very keen developers there who were all able to quickly pick up the basics of the framework and building new experiences. 🤩 So cool to see #WebVR / @AFrameVR in the valued list of experience for MIT @MediaLab upcoming @RealityVRHack hackathon! It was just a teeny, tiny bug fix, but my first ever contribution to @aframevr just got merged! I am disproportionally proud of that fact.